Habteab Tsegay is a psychosocial counselor, CVT Ethiopia. 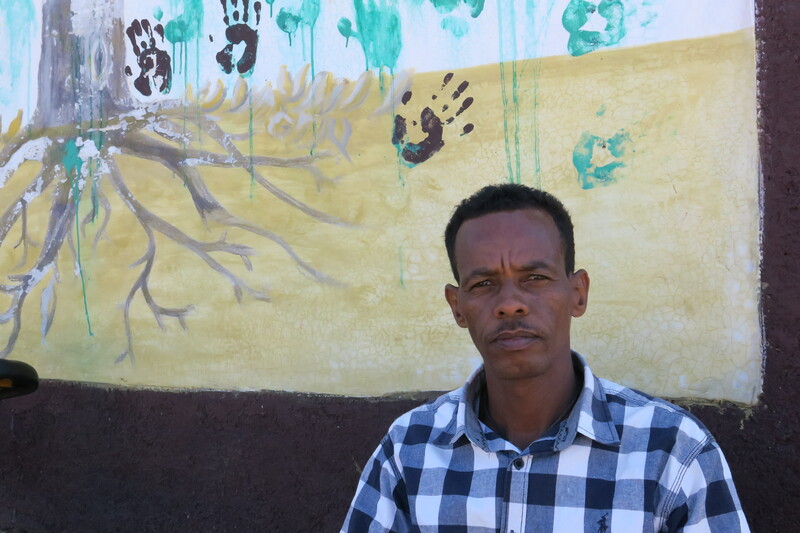 In the refugee camps here in northern Ethiopia, there can be a problem in the community if a person has a mental health problem – the community may feel that the person cannot be helped or healed. They won’t let that person socialize and keep them away. This is a very important situation for CVT. To address this, we do sensitization events in the community to normalize symptoms, create awareness of CVT’s rehabilitative care and help stop the stigma that some people associate with mental health care. To address this stigma, we take different approaches. When we do sensitization events, instead of just talking in front of the community about our services, we ask former clients to speak. They can witness and show the people practically how they have built up their lives again after the counseling. Today, they live normally. This creates great awareness to stop the stigma. When I first came to the camp in Ethiopia, I didn’t know about CVT. I had attended college in Eritrea, but I was selected for the military, so I could not continue in school. I escaped and came here. I continued my education in Ethiopia and received a degree in social anthropology. When I saw a psychosocial counselor position posted for CVT in the camp I applied. I Googled CVT to get information, and I became very highly interested in the rehabilitative care for torture survivors. I am one who has had difficult experiences in life, and so I want to help other people. As a psychosocial counselor, I do my work with the training from a supervisor. The training is ongoing, every two weeks, and it helps me provide good service to my community. The most important thing in my work is to help the community, to serve the community and make sure the clients are satisfied by what we’re doing. I am always working to help people understand that CVT is not only for very serious mental illness. I appreciate how the community’s impression of CVT has completely changed. Having former clients witness made a big difference. And my impression changed too. At the beginning when I started working with CVT’s group counseling sessions, I was confused. I said to myself Are the clients going to get benefit? Will they really be healed? And then I started to see significant changes. I saw the clients begin to put effort into rebuilding their lives. At the beginning of our 10-week counseling cycle, clients don’t want to talk. They don’t even say their names. They stay silent. Very shy. Then from session to session, you start to see people actively participating and sharing their experiences. They get to know each other and start talking. They come to learn that if you share your difficulties, you’ll get relief from the feelings you’ve kept inside. I even notice those who had very difficult experiences start to tell themselves to be strong and to cope. I see hope in clients in the groups when I see them share experiences with each other. They also share a lot of the activities we do in the sessions, and they can use these techniques outside the sessions when they’re feeling overwhelmed and have to calm themselves. When they are feeling very low, we give them techniques to energize themselves, things that will help and that they can do at home. The best thing in my job is the group counseling when the clients start talking about their life experiences. The sessions help clients see from the beginning of their life up to the moment they’re in right now. They work through what has happened to them in the past, and when they reach those difficult moments, they get support. When I observe this, it gives me great meaning. I’m learning something meaningful, something important. I tell the clients, if they always have hope in life, their future will be bright. If they put the effort in, their future will be bright. Hope is the key thing in life.